for heart disease and stroke. 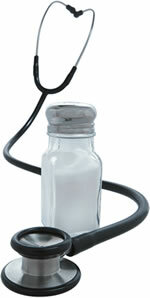 A few simple steps can help you reduce your sodium intake and improve heart health. How's your sodium intake this week? Most health-conscious men already know that sodium raises blood pressure—and that high blood pressure, in turn, boosts the risk of heart disease and stroke. As for how much sodium an individual takes in from all sources, it's hard to say. There is no simple test you can take—like having your cholesterol checked—to make sure you are in the sodium safe zone. What we do know is that the average American gets too much sodium—about 3,400 milligrams (mg) per day, or the amount of sodium in 1.5 teaspoons of table salt. The average intake for men ages 20 and older is even higher: just above 4,200 mg per day. If the trend continues, many more Americans could end up with high blood pressure and face higher risks of heart attack and stroke. Where are we going wrong? "About three-quarters of the sodium that the average person takes in each day comes from processed foods we purchase in the supermarket or restaurant meals we eat out," says Dr. Elliott Antman, professor of medicine at Harvard-affiliated Brigham and Women's Hospital and the president of the American Heart Association (AHA). "It is not just using too much salt from a saltshaker at home. In fact, throwing away your saltshaker would not really solve your problem." The ideal daily intake of sodium is still a topic of intense debate among experts, although they do generally agree that Americans get too much sodium. Reducing sodium intake lowers overall health risks, although it's difficult to predict in a given individual how much of a blood pressure reduction is required to prevent a heart attack or stroke. The fact that scientists don't agree on everything about sodium and health isn't a reason to do nothing. Continue to take reasonable steps to keep your sodium intake in check. That starts with a greater awareness of the sodium in your food. Maintaining a healthy weight and emphasizing whole plant-based foods can also help. "Perfection is the enemy of the good," says Dr. Joanne Foody, director of cardiovascular wellness services at Harvard-affiliated Brigham and Women's Hospital. "In the United States, there is sodium in virtually everything." Read nutrition labels. Added salt (sodium chloride) contributes to your sodium intake, of course. Sodium also sneaks in with other additives. 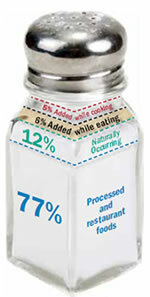 Reading nutrition labels will make you more aware of how much sodium you consume per portion of a food. That's important, because different brands of the same types of foods may differ sharply in the amount of sodium they contain. Use the nutrition labels to compare, and try the version with less sodium per serving. Also, buy whole, unprocessed foods and prepare them yourself at home. sandwiches (including burgers) from fast-food restaurants. Scrutinize restaurant meals. Restaurant meals, especially those purchased at chain restaurants, can be packed with sodium. That doesn't mean you should never eat at restaurants; instead, choose lower-sodium items when you can. For example, sauces tend to be salty, so order meals without sauces or ask for the sauce on the side so you can dip rather than slather. Restaurants do not have to disclose the nutritional content of their products, although some do so online, or may provide details at the restaurant if you ask. You may be surprised by how much the sodium content for a food differs depending on how it's prepared, or how the sodium content of the same dish varies from one restaurant to another. Cut back on calories. The more food you eat, the more sodium you will consume. This is why achieving and maintaining a healthy weight helps to limit sodium consumption. "If you reduce your caloric intake, you are eating less of processed and restaurant foods that have sodium," Dr. Antman says. And of course, maintaining a healthy weight by itself helps prevent a range of illnesses. Potassium does not directly lower sodium, but getting adequate amounts of it can help to counteract sodium's effect on blood pressure. "The best thing to do is eat higher-potassium foods like fruits and vegetables," Dr. Antman says. The AHA recommends four to five servings each of fruits and vegetables per day, totaling eight to 10 servings. A typical serving is about ½ to 1 cup. Potassium-rich plant foods include tomatoes, spinach, sweet potatoes, avocados, dried apricots, bananas, oranges, and cantaloupe. A single cup of cooked spinach contains over 800 mg of potassium. Grains, nuts, and juices also supply potassium. The ongoing scientific debate over dietary sodium goals hinges on evidence, and unfortunately the evidence is incomplete and inconclusive. The American Heart Association says you should strive for 1,500 mg a day from all sources for ideal heart health. In contrast, the U.S. Dietary Guidelines for Americans say 2,300 mg a day is low enough for many people. Both recommendations are based on evidence, but they interpret the facts differently. man, this debate may be somewhat academic. Most Americans are nowhere near 2,300 mg, much less 1,500 mg. If you are unsure of how much sodium you should consume, ask your doctor for advice. To learn more, go to heart.org/sodium and www.dietaryguidelines.gov.